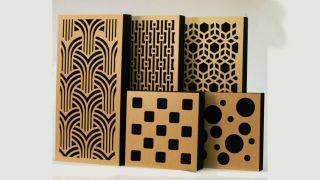 The What: GIK Acoustics has launched the Impression Series, a line of acoustic panels and bass traps with decorative plates designed to deliver a visual statement to enhance any room. The What Else: The Impression Series panels are engineered to create an even balance of low-end absorption without losing high-frequency presence. The rigid plate not only gives the panel a stylish appearance but also helps reflect/scatter high frequency content in the room giving the proper balance needed. GIK offers the Impression Series panels in five designs: Bubbles, Checkerboard, Gatsby Arches, Mod Geometric, and 3D Cubes, in three standard sizes: Square (24x24 inches), Narrow (12x48 inches), and Rectangle (24x48 inches). They are available in 2-, 4-, and 6-inch-thick form factors, with a choice of blonde wood veneer, and black or white rigid vinyl plate finishes. The Bottom Line: The Impression Series panels are designed to not only perform well in critical listening environments (audio rooms or studios) but to also fit well in any space. The Impression Series panels are well suited for professional, household, or public places where the room acoustics interfere with enjoyment or productivity, and where speech intelligibility is compromised by reverberation.